What, I wonder, are the key ingredients of a successful, long-running village social club? Could it be the Members themselves, the Speakers, the organised Outings and planned Activities – or a combination of them all with a good helping of camaraderie thrown in? Whatever the recipe, Capel Ladies seem to have got it right as they are celebrating 50 years since their birth in 1968 as “Young Wives”, prompted by a suggestion from Father Ingham, the Rector at the time, of St Mary’s Church in Capel St Mary. According to the old Diary, fifteen “young wives” attended the first meeting on 24th September, of which five offered to act as a committee under the leadership of Mrs Mavis Wilson. There was a suggested annual membership fee of five shillings plus a one shilling charge at each meeting for tea and biscuits. The cost of renting the church hall was twelve shillings and sixpence! The group decided to meet on the second and fourth Tuesdays of each month at 7.45pm. Early talks included “Slides from Africa” by Wing Commander Birch, Accident Prevention in the Home, a wig demonstration and a talk from the matron of St Mary’s Hospital, Tattingstone! To raise funds for the club a coffee morning was organised with a Bring & Buy Stall, which apparently raised the princely sum of £8 after expenses! By the time of the A.G.M. in January there were 21 members, and by January 1970 the numbers had grown to 35! A regular event organised by the club was the annual Children’s Christmas Party, and at one of these 90 children attended! They were entertained by a magician – Uncle Sam from Ipswich – and of course Father Christmas came too! Each child had to pay 1/6d and also bring a present with them for someone else! Capel Ladies present a colour TV to Ipswich Hospital, October 1985. Apart from this there were regular cake stalls, fêtes to help at and charities to raise money for. In 1970 some young wives ran a coffee morning and made £17 which they spent on a “wireless” for one of the wards in St Mary’s Hospital Tattingstone. Boat trip on the Deben, Dog Racing at Romford, Badger-Watching, Garden Visits, Meals out, Coach trip to Sandringham, visits to local Potteries and a Chocolate-making Shop – all enjoyable Outings. Popular Talks remembered included the one on Harrods Department Store by Sue Smart, the visit by Sniffer Dogs, the talk and demonstration of his work by ladies Couturier Brian Piccolo, the talk by Street Pastors, Jenny Gibbs’ Turkish talks about everyday life in Turkey as well as the history of the Ottomans, plus various travel talks both local and international. Social Evenings such as our Barbecues, Summer and Christmas celebrations, and also the Craft Evenings are all fun activities. There’s definitely a good mix of stuff going on – something for everyone! The club of course has changed its name from “Young Wives” first, to “Capel Wives” to include young and old alike, and then to “Capel Ladies” – which was felt to be a much more inclusive title. We still have around 50 current members, some of whom joined in the early years as newly-weds who had just moved to the village and were looking to make friends. However, we don’t think of ourselves as a club exclusively for older members these days – after all, we have a range of very interesting talks and speakers, not to mention activities and outings, which would definitely be of interest to all ages! 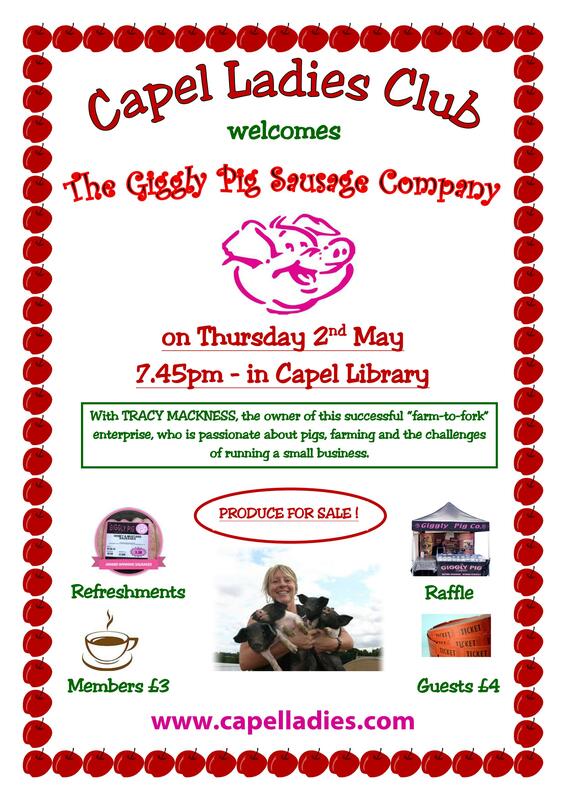 YOUNG WOMEN OF CAPEL – COME AND JOIN US! We are holding our own special celebration dinner (with outside caterers) on Thursday 4th October at our usual meeting time of 7.45pm, almost exactly on the 50th anniversary of the Club’s first meeting! I’m sure we’ll all raise a glass of something sparkly and propose a toast to the NEXT 50 years!